The NASA-USDA Global soil moisture and the NASA-USDA SMAP Global soil moisture datates provide soil moisture information across the globe at 0.25°x0.25° spatial resolution. These datasets include surface and subsurface soil moisture (mm), soil moisture profile (%), and surface and subsurface soil moisture anomalies. Soil moisture anomalies are unitless and represent standardized anomalies computed using a 31-days moving window. Values around 0 indicate typical moisture conditions, while very positive and very negative values indicate extreme wetting (soil moisture conditions are above average) and drying (soil moisture conditions are below average), respectively. This dataset is generated by integrating satellite-derived Soil Moisture Ocean Salinity (SMOS) Level 2 soil moisture observations into the modified two-layer Palmer model using a 1-D Ensemble Kalman Filter (EnKF) data assimilation approach. 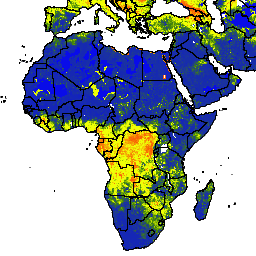 The assimilation of the SMOS soil moisture observations helped improve the model-based soil moisture predictions particularly over poorly instrumented areas (e.g., Southern African, Middle East) of the world that lack good quality precipitation data. This dataset was developed by the Hydrological Science Laboratory (HSL) at NASA’s Goddard Space Flight Center in cooperation with USDA Foreign Agricultural Services and USDA Hydrology and Remote Sensing Lab. This dataset is in the public domain and is available without restriction on use and distribution. See NASA's Earth Science Data & Information Policy for additional information. Bolten, J., and W. T. Crow (2012). Improved prediction of quasi-global vegetation conditions using remotely-sensed surface soil moisture, Geophysical Research Letters, 39 (L19406). Bolten, J., W.T. Crow, X. Zhan, T.J. Jackson, and C.A. Reynolds (2010). Evaluating the Utility of Remotely Sensed Soil Moisture Retrievals for Operational Agricultural Drought Monitoring IEEE Trans. Geosci. Remote Sens., 3(1), 57-66.